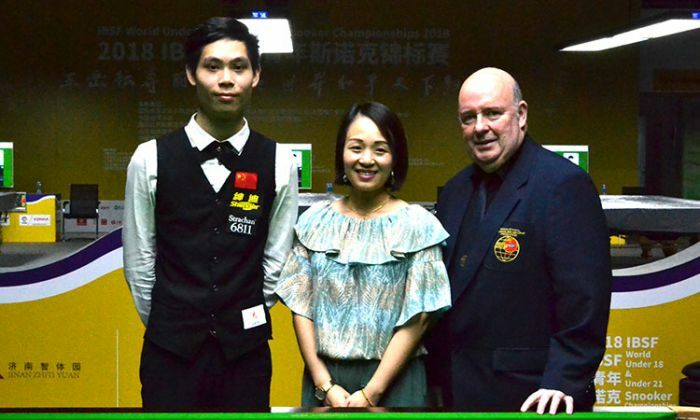 Chinese player Guo Qiang He has now become the 2018 IBSF World Under-18 Snooker Champion. In the final he defeated his compatriot Pengfie Lei after deciding frame 5-4. For Pengfie, this is his second consecutive appearance in the final of Under-18 and both time he couldn’t succeed. Last year he lost to Muhammad Naseem of Pakistan. Today’s the final match was quite interesting as on one side, Pengfie demonstrated the break building technique and recorded five breaks during the match, Guo Qiang shown more consistency and won the title with just one break of 50 points but he kept scoring regularly. Though he recorded highest break of the competition 136 during the league stages. Earlier in the morning session, the semi-final was also between all China players. In that Guo Qiang He defeated Bingyu Chang 4-2 and Pengfie knocked out Yisong Peng 4-1. The prize distribution ceremony for Under-18 will take place alongwith Under-21 on 11th July. The Men and Women Under-21 competition will start tomorrow and the playing schedule / groups are already released on website.